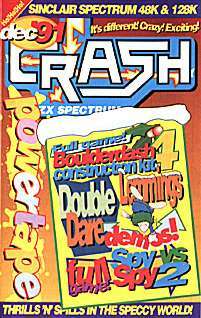 If you can’t wait to read the Lemmings review, whap this month’s Powertape into your cassette deck and save those Lemmings! What’s a Lemming, you may ask (a bit louder, please). Well, he’s a green-haired little chap with the very disturbing habit of leaping off tall buildings. Not the safest of pastimes, but then the player is expected to save the suicidal little creatures from the myriad dangers that face them as they yomp across the many landscapes and into their homes. The game consists of 60 levels split into four categories, Fun, Tricky, Taxing and Mayhem. The aim of the game is to guide the Lemmings across a dangerous patch of ground and make sure they get home safely. The start of the level informs you how many must be saved to move onto the next (even tougher) level. The Lemmings drop from a trapdoor set at the top of the screen, and merrily set about doing their thing (leaping off tall buildings, drowning etc) against a vicious time limit. If they hit a solid object they bounce off and retrace their steps, if they hit water/acid, they drown. The suicidal creatures can be controlled by clicking on one of the ten icons ranged across the bottom of the playing screen. On the early levels, all of them are available, so you can bash, climb, dig and float to your heart’s content. But as time goes on, the old brain box needs to be used as less and less functions are available — and the already short time limit drops even lower (Panic City!!). CLIMB: The selected Lemming becomes a climber. Chris Bonnington lookalikes, ahoy! EXPLODE: Using this option will trigger a five-second timer. When time’s up, the offending Lemming will explode and splatter horrible squidgey bits all over the landscape! NUKE: It’s mega-apocalypse time, folks! If you’ve ballixed a level up, this kills all the Lemmings at once! Stones? Gravel? Pebbles? Nope, boulders, and lots of ’em, as you become a strange, insect-like creature called Rockford, pilfering diamonds and dodging butterflies, amoeba and the aforementioned large, rotund rocks! The object of Boulder Dash is to search through caves and collect the indicated number of diamonds within the time limit. The way to solve the caves is usually very simple, but not at first apparent. Read the description of the game elements in the Construction Kit section to understand more about the different aspects of the game. Once the game section has finishing loading, you’ll be asked to select your control options, then the type of machine you’re using (48/128K). You can move your character, Rockford, around the cave using the joystick or keys. If you find you can’t complete the cave you’re on, pressing Break will make Rockford commit suicide! You can then start the cave again. You are awarded an extra life every 500 points. By using this part of the program, you can create your own Boulder Dash caves and intermissions. You can also make a complete game by using up to 64 screens of caves and intermissions. These designs can be used with the Boulder Dash IV game. Starting: When editing for the first time, you’ll be presented with a menu that gives the choice of editing a current cave or intermission or creating a new one. Use the joystick/keys to move the pointer on the menu, and click on the desired option. Along the top or side of the screen you will see a number of icons. Boulder: The rocks will fall if unsupported and can be pushed if there are no objects in front of it. When selected, place on the gamescreen by moving the pointer and pressing the fire button. Diamond: In every cave a certain number of diamonds need to be collected to win, and to leave the cave. Enchanted Wall: Looks like any other wall, except when hit by an object it will ‘mill’ for a certain time. During this time, it will turn boulders into diamonds and vice versa. Wall: A regular wall used to build spaces and paths. It can’t be crossed, but can be destroyed by explosions. Titanium Wall: This wall is indestructible. Growing Wall: If there are no obstacles next to it, this wall will grow into any free space. Extra Rockford: These won’t move, but you must protect them from being destroyed by boulders etc. Dirt: Used as a filler. Stops all objects except Rockford! Fireflies: They explode on contact, killing Rockford. They are destroyed by dropping boulders on them, or by contact with amoeba. Butterflies: They behave like fireflies, except they produce diamonds when they explode. Amoeba: This grows through dirt, and unless confined (when it will turn into diamonds) will eventually turn into boulders. Slime: Looks like amoeba, but allows rocks and diamonds to pass through. Hidden Exit Door: This door looks just like a Titanium wall, and is obviously difficult to find. Exit Door: This will be revealed as soon as the required number of diamonds have been collected. Entrance: This is where Rockford starts. Line Mode: This draws a row of the current icon selected. Click for the start position, and click again for the end position. Random: Selecting the dice icon will place 20 of the selected objects on the game screen randomly. Eraser: (press E) This selects an empty space, which can be used to delete misplaced objects. C: (press C) A colour menu will be displayed. Move the joystick until you get the desired colour, then press fire to select another colour register. T: (press T) This tests the screen you’re editing. Use the joystick to control Rockford. You have one life only. M: (press M) This selects the main menu described below. N: (press N) This selects a new screen, and clears the cave/intermission you’re working on. P: (press P) This removes the selection panel, enabling you to work on a larger area. CLOCK: (press V) This allows the timings and counters to be altered. Use the joystick/keys to alter the values. F: (accessed from keyboard only) Full screen; allows you to view the whole playing area. Using the main menu, you can set a sequence using load and save. Simply load each cave in turn and save them onto one tape after the other, making a note of how many caves/intermissions are in your sequence. They can be re-loaded at the start of a Boulder Dash IV game. A note about caves and intermissions: A standard Boulder Dash ‘game’ consists of a total of 16 caves and four intermissions. The caves are made up of four screens of maze and this is where the players must collect the required diamonds. Every four caves the player is rewarded with a ‘bonus game’, the intermission. This is just a single screen, where he/she can score extra points or lives. Obviously, using this kit, one can alter the number of caves and intermissions to any number or sequence. The wild ’n’ wacky (or should that be whacky?) monochrome spies from Mad magazine are back for more manic head-to-head trap-setting, sword-brandishing fun! This is the second game in the ever-popular battle between the black and white spies. Like its predecessor, it’s a one or two player rib-tickling affair. Here the eternal enemies are stranded Robinson Crusoe-style on a desert island, where a top secret missile codenamed the XJ4 (and a quarter) has crash-landed. It’s scattered in three pieces and our lovable rogues are after it, with the usual hilarious results. Once the game’s loaded you’re presented with a list of options. These are number of players, control options (keys, Sinclair, Kempston and Cursor joysticks), difficulty level, computer player intelligence and whether the rescue submarine is hidden till the end of the game. As for movement, imagine the screen is a three-dimensional area where you can move left, right and in or out of the screen. Moving left and right is simple enough, but when gaps appear in the background or foreground, your character can move up or down the screen respectively (it makes sense, honest). These gaps are passageways which lead other parts of the island, essential if you’re to find and assemble the missile before your opponent does. Pressing fire within range of an object or mound of sand (three small triangles) will pick/dig it up. If you’re unlucky (or clumsy), you’ll run into a booby trap left by your adversary, but you can be just as cruel with the help of your Trapulator. ??? Pick up/drop object ??? The Trapulator allows you to store and use various items and tools needed to complete the mission. Along the side of the screen are a number of icons, next to them an indicator shows how many of a certain object you possess. There’s only one gun on the island, so make sure you find it first. But beware, some of the bullets are duds and the gun isn’t always fully loaded. Hand-to-hand combat is inevitable on an island as small this one, but of course these two rivals are past masters in devious tactics. Holding down the fire button will make your character whip out a dirty great sword. Moving left or right while holding down fire will make your spy buckle his swash. But be warned, once within duelling range the Trapulator won’t work. Combat ends when one of the combatants moves off screen or expires. There are four types of nasty traps available: coconut bombs, Napalm, rope snares and a shovel for digging pits. To place a trap, simply press the fire button twice and select the trap required, then press fire again to hold the trap. Position your spy and hold down fire while pushing forward on the joystick. You’ll hear a whooshing sound; this indicates the placement of the trap. Now watch where you tread! Snares are set by selecting the rope and pushing your spy up against a tree. The spy will climb the tree and tie the rope to the top. You may then position the noose at the base of the tree. To make a coconut bomb you (obviously) need a coconut and some petrol (a fruity version of a Molotov cocktail). The amount of fuel you possess is shown at the bottom of your Trapulator. If needed, more fuel can be obtained from a wrecked plane somewhere on the island. Once you’ve dug a deep pit you can leave it as it is, or be really horrid and lay some sharpened stakes in it to perforate your opponent’s botty. But beware: the spade tends to break after eight pit diggings. The island you’re standing on isn’t that big, but it’s advisable to use the inbuilt map (unless both players are on the screen simultaneously, in which case it wont work). Shown on the map are yourself (as a flashing square) and white areas denoting the whereabouts of missile parts. On levels five and six there are two islands to search. The problem is there’s only one safe place to cross and your foe will no doubt be waiting for you! As pointed out earlier, the missile is in three pieces, but you can only hold one piece at a time. Also you have to connect the pieces in order (ie, the head, middle then tail section). Once two or more pieces have been assembled, they count as one whole piece. Anyone who’s been up early enough on a Saturday morning (that counts out the whole CRASH team) will know the ins and outs of this amazing gameshow that appears as part of Going Live! Introduced by mega-star Peter Simon, the game involves two teams battling it out in a trivia quiz. If you can’t answer the question you’re asked, you can ‘Dare’ it to the other team, who can earn bonus points. If they’re a bit dim and can’t answer it, they can ‘Double Dare’ it back again. The poor team that’s left with the duff question can either answer it for lots of points or take a ‘Physical Challenge’. They decided to go for a different kind of challenge instead. The challenges in the Double Dare computer game are of a mental nature with lots of puzzles and brain ticklers to be tackled. You can select keyboard or joystick at the start of the demo. The keys are Q-Up, A-Down, O-Left, P-Right, SPACE-Select. So what amazing challenge have we got in store for you? You’ll be presented with a screen full of small shapes to sort into vertical rows before the time runs out. You move a small frame around the screen until you find the shape you want, then press fire and left or right to rotate it inside the frame. The finished game will have many challenges and questions to be answered. If you win the quiz you’ll go on to an assault course to win prizes! As a little taster, you’ll be shown selected screens if you manage to complete the demo! * It is inadvisable to put your computer into a washing machine and switch it on. So don’t do it!